Savings bonds mature in three stages over 30 years. 1. Does the Rate on a Savings Bond Fluctuate With the Market? 2. What Are the Differences Between 20 Year Bonds Vs. 1 Year Bonds? 3. When an I or E Savings Bond Matures Is It Worth More Than the Face Amount? U.S. Series EE savings bonds are among the safest investments in existence. If held to maturity, they also provide a very competitive return. Savings bonds have a complex three-stage maturity structure covering a 30-year span. This requires that you pay close attention to how much time has elapsed since you bought your double E bonds, if you want to get the maximum possible return. U.S. savings bonds are a zero-coupon accrual type of security. That means interest is added to your principal twice a year rather than being paid to you. Taxes on the interest are deferred until it is paid to you. 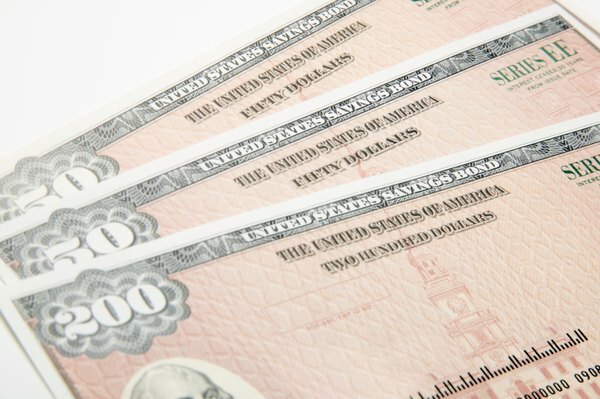 The interest rate on savings bonds is adjusted every six months, on May 1 and Nov. 1, and it applies to all bonds sold for the next six months. The bond rate is based on market rates for 10-year Treasury notes. When you buy a bond, the interest rate in effect on the day you purchase the bond is the rate you will receive throughout the 19-year first stage of the maturity process. As of Nov. 1, 2012, the savings bond interest rate was reduced to 0.2 percent, compounded semiannually. This rate applied to all bonds bought between November 2012 and May 2013. Bonds bought before November 2012 continue earning the higher rates that were in effect on their purchase dates. In the third stage of the savings bond maturity process, the bond will continue to earn interest for 10 years after original maturity. The rate during this final maturity stage reverts to the rate in effect at the time of purchase, unless the Treasury announces a new rate or rate structure for bonds in their final maturity period. After 30 years, savings bonds are fully matured and stop paying interest.